No, not this kind of split screen. The iPad has an amazing split-screen mode. It’s called Split View, and it lets you use two apps side-by-side. On certain iPads, you can even float a third app over the top. 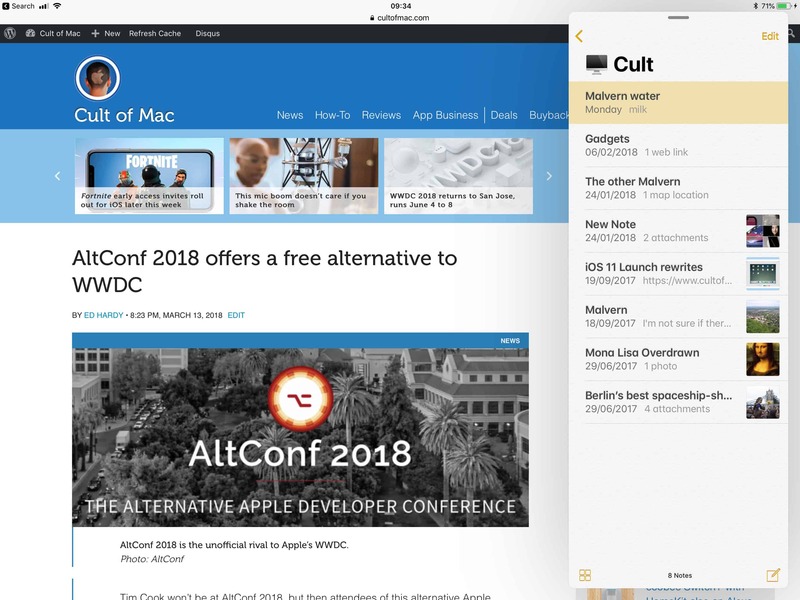 Split View lets you drag and drop text, pictures, links and almost anything else between apps, just like on a Mac or PC. It’s also super-easy to use. Let’s see how. The iPad’s Split Screen mode is quite useful. First, let’s check the difference between Slide Over and Split Screen, or Split View. 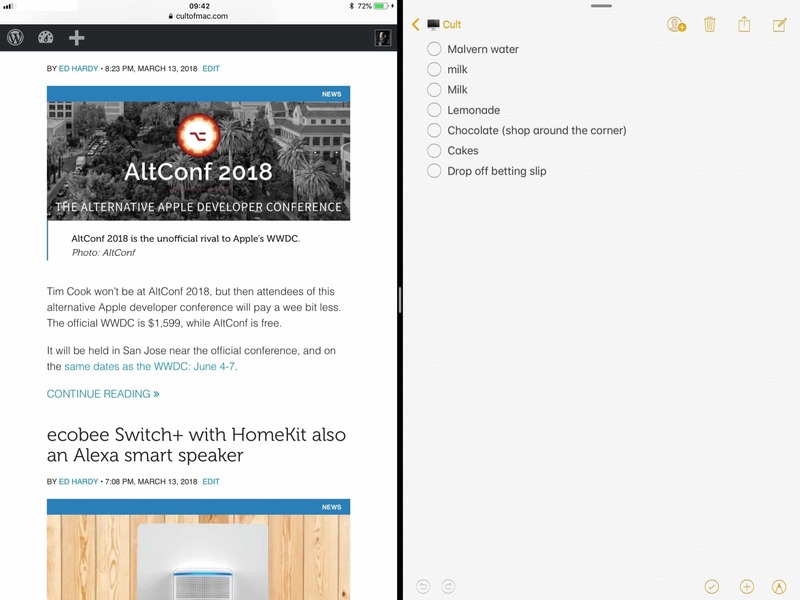 In Split View, two apps share the screen. They sit next to each other, and the screen is split either 50:50, with each app getting an equal share of the screen, or roughly 70:30 (or 30:70), with one app getting more space than the other. Slide Over is when one app still takes up the entire screen, but another floats over the top in a skinny little window. This thin window can be swiped in and out of the right side of the screen, parking it when you don’t need it and summing it when you do. This is great for temporarily using an app and then dismissing it. You could watch a movie and occasionally swipe in the Messages app, or use Safari and Slide Over the Notes app when you need to save a link, or an image. Just drag an app over another one to enter Split Screen. Both Split View and Slide Over start the same way. With an app already on screen, just swipe up from the bottom of the screen. This will bring up the iOS 11 Dock. If the app you want to use is in the Dock, just drag its icon into the main part of the screen, over to the left or the right. When you get it close to the edge of the screen, there main app will blur, and squish up to make a little dark gray gap at the edge. Just drop the app into this gap, and you’re using split screen. 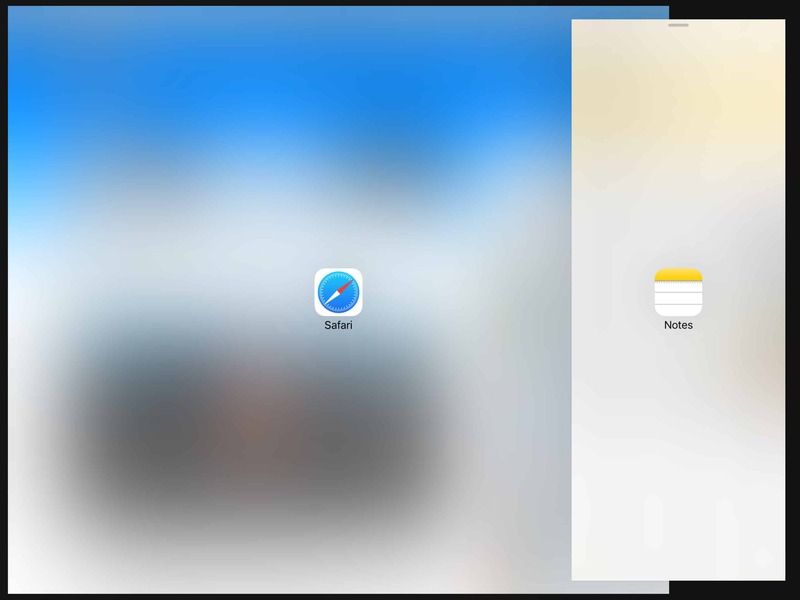 If you use an app often in Split Screen, you should make sure to keep it in the Dock. You can drag apps from other places, but the Dock is the quickest and easiest. Here you see two apps sharing the screen fifty-fifty. This puts you in the 70:30 version of Split Screen. To share the screen 50:50 between the two apps, just grab the little gray hand in the middle of the black line that divides the two apps. Drag this handle left or right to resize the apps. To exit Split Screen, you do the same as if you were resizing the apps, only you keep going. That is, you resize one app until it takes up the whole screen, and the other gets smashed right off the edge of the display. You can do this in either direction, to get rid of either the leftmost or the rightmost app. Slide Over starts off the exact same way as Split View. You drag an app icon from the Dock (or elsewhere), and drop it over the main app. The difference is that, with Slide Over, you drop the app nearer to the middle of the main app. If you keep going towards the edges, the screen blurs and gets ready for a Split View drop. So you just have to drop the app before you get close to the edge. After dropping it, the new app will float over the main app in a little movable window. The Slide Over window can be placed anywhere, even off the side of the screen. You can do a few things with this Slide Over app. The first is to drag it from one side of the screen to the other. To do this, just grab the little gray bar at the top of the Slide Over window, and drag to the left or the right. If you keep going towards the right, you can swipe the window right off the edge of the screen. 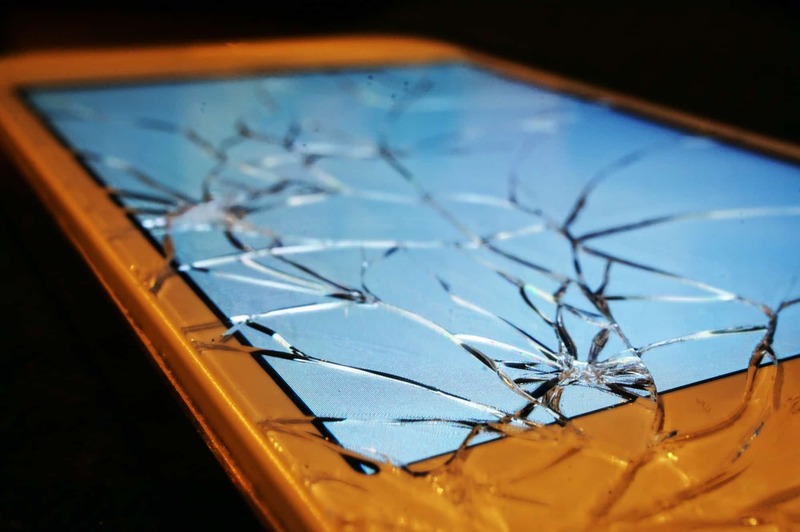 To get it back, just swipe in from the right of the screen, starting from the very edge. The Slide Over panel will slide back onto the screen. To turn the Slide Over panel into a full Split View app, just grab that little gray handle and slide it upwards. The main app will move itself to allow space, and you’ll be in Split View. To replace Slide Over app with another one, just go grab the new app from the Dock and drag it out. The current Slide Over app will just disappear. You can even float a third app over two split screen apps. The easiest place to keep your apps for quick access is in the Dock. If the Dock gets crowded, you can put some apps into a folder and then drag that to the Dock. And app inside a Dock folder can be dragged out to Split Screen. You can also grab an App from the Home screen. First, press the Home button to go to the Home screen. Then start dragging the app you want to use in Split View or Slide Over. Then, while still dragging, tap the main app so it launches. Then, when it has launched, you can use the app you’re still dragging just like you’d just dragged it in from the Dock. 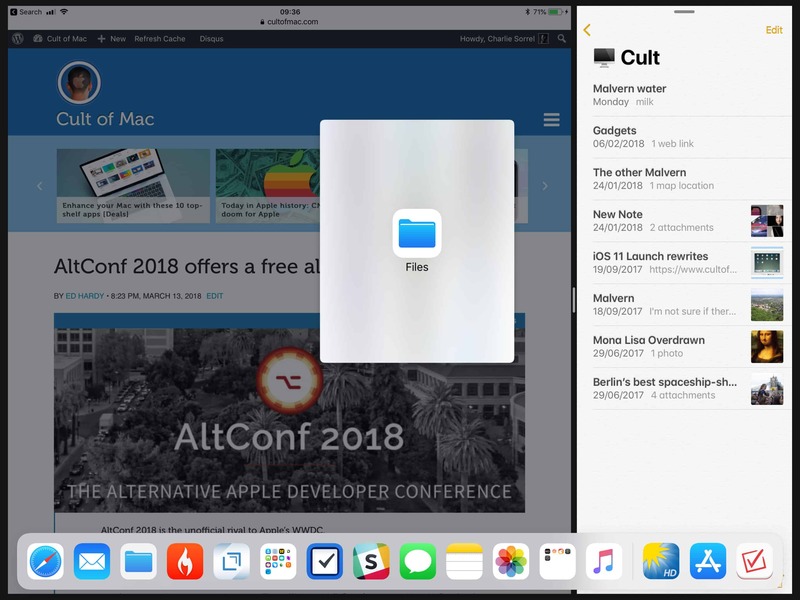 You can also drag an app in from a Spotlight search, although this is only really practical if you have an external keyboard attached to your iPad. With the main app open, just press Command Space on the keyboard, then type to search for the other app you want. When its icon appears in the search results, just start dragging it. The Spotlight search screen will disappear, and the main app will return. Then just drag the new app to Split View or Slide Over.